This coffee cup dispenser features doubles compartments which can be used to display dispense coffee cups or lids. It may can be wall mounted or displayed as a countertop dispenser. This Coffee Cup Dispenser offers a Outstanding way to show your merchandise. 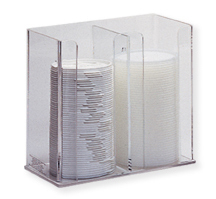 Constructed of clear Acrylic, this Countertop Food Service Dispenser is sure to impress. Buy Coffee Cup Dispenser now - Use our convenient shopping cart or give us a call and place your order with a knowledgeable service representative today!